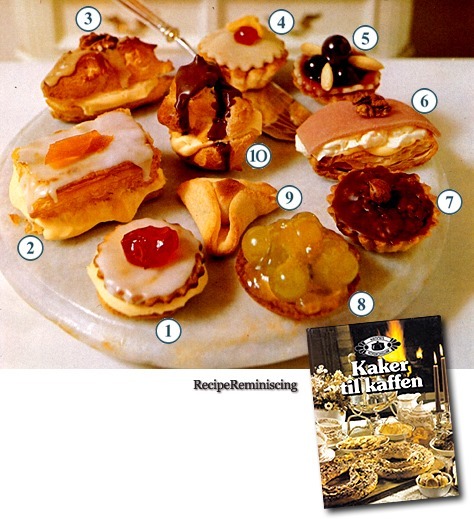 10 classic small cakes based on three basic doughs; Short Crust Pastry, Puff Pastry, Choux Pastry and one classic Norwegian creamy cake filling and topping. This entry was posted in 1970's recipes, Baking, Cakes, Food, Recipes and tagged Filled Profiteroles with Chocolate Glaze, Glazed Medallions, Grape Cakes with Almonds, Grape Cakes with Jelly, Josephine Cakes, Marzipan Cakes, Mocha – éclairs, Napoleon Cakes, Napoleon Hats. What a wonderful post! Lost of info and great recipes!